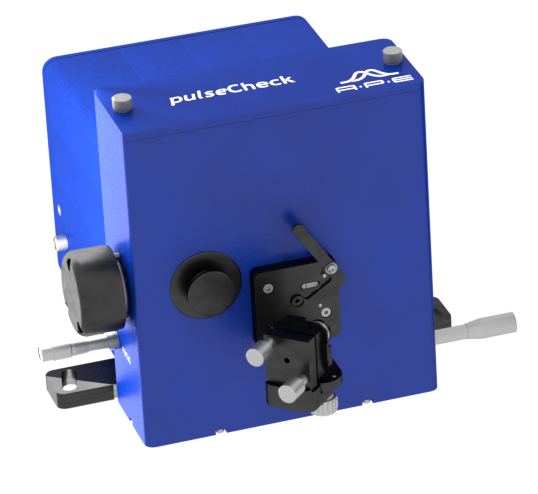 Ask RP Photonics for advice on choosing the most suitable technique for pulse characterization, and finding the most suitable hardware. Frequency-resolved optical gating [1, 3] is a technique for the “complete” characterization of ultrashort pulses, i.e. for measuring not only pulse parameters such as the pulse energy or pulse duration, but also the full time-dependent electric field or (equivalently) the optical spectrum including the frequency-dependent spectral phase. (The carrier–envelope offset and the arrival time of pulses can not be measured.) This technique has been pioneered by Rick Trebino's research group at the Georgia Institute of Technology. Figure 1: Setup for frequency-resolved optical gating in the form of SHG FROG. The spectrum of the nonlinear mixing product of the two beams is measured as a function of the relative time delay. 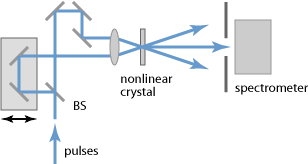 A typical setup for a FROG measurement (Figure 1) is similar to that of an intensity autocorrelator, except that the photodetector is replaced with a spectrograph. A FROG measurement involves recording some tens or hundreds of spectra for different settings of the arrival time difference of the two pulses. These data can be illustrated in the form of a so-called FROG trace (see Figure 2), which is a kind of spectrogram and displays with a color scale the intensity as a function of time delay and optical frequency (or wavelength). A sophisticated iterative phase retrieval algorithm, implemented as a computer program, can then be used for reconstructing the pulse shape from the FROG trace. As the recorded data are substantially redundant, the FROG retrieval algorithm can not only deliver the pulse shape, but also carry out a consistency check. It may thus be noticed when errors occur, e.g. due to wrong calibration of the spectrometer. On a typical PC, the procedure may take a few minutes with a non-optimized algorithm, and optimized algorithms have been developed which make it possible to do the calculations in less than 0.1 s, at least for simply shaped pulses. 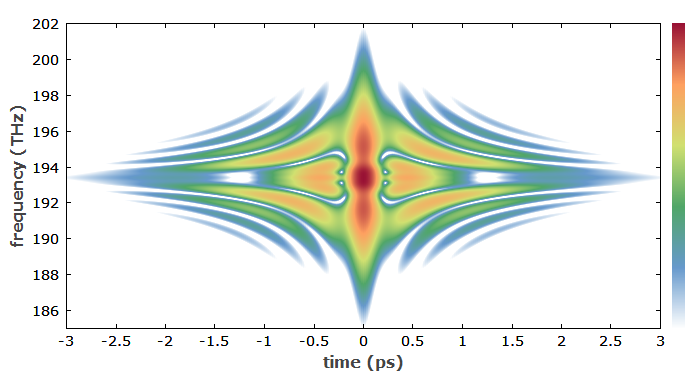 Figure 2: SHG FROG trace for a higher-order soliton pulse after some propagation length in the optical fiber. The color scale (near the right axis) is applied to the logarithm of the FROG intensity. The simulation was done with the software RP ProPulse. The term “frequency-resolved optical gating” originates from the idea that a short gate pulse can be used to obtain a sample from a longer pulse by nonlinear mixing (gating) in a nonlinear crystal material. As an additional gate pulse, shorter than the pulse to be investigated, is usually not available, FROG actually uses the pulse itself for gating. This makes the method much simpler to apply, but at the same time conceptually and computationally more sophisticated. Polarization-gated FROG (PG FROG) is the conceptually simplest FROG variant. Here, the gate pulse, polarized under 45° relative to the probe pulse, rotates the polarization of the latter when overlapping it in a χ(3) medium (e.g. fused silica), and thus leads to transmission of the probe through a polarizer. As always with FROG, the transmitted probe signal is analyzed with a spectrometer. Advantages of PG FROG are easy alignment, the absence of ambiguities in the retrieval, and the generation of fairly intuitive FROG traces. A problem is that a polarizer with very high extinction ratio is required. In self-diffraction FROG (SD FROG), two beams overlapping in a χ(3) medium generate a nonlinear refractive index grating, which diffracts both beams into new beams, one of which is used for detection. As no polarizers are required, SD FROG can be applied in various spectral regions, e.g. in the deep UV region. However, relatively high pulse energies are required. Transient-grating FROG (TG FROG) also uses a nonlinear refractive index grating, but uses a third pulse with variable delay as the probe which is diffracted at the grating generated by the other two beams. For various reasons, it allows for a much higher detection sensitivity than SD FROG. Second-harmonic FROG (SHG FROG) is the most popular FROG variant. It is based on a χ(2) nonlinear crystal and can thus reach a much higher sensitivity than is possible with all χ(3) versions of FROG. Phase-matching issues have to be carefully treated to avoid distortions for short pulses. There is an ambiguity concerning the direction of time, which can be removed e.g. by performing an additional measurement with some glass piece in the beam path. Interferometric FROG (IFROG)  uses a collinear geometry, avoiding a loss of temporal resolution via geometric effects (finite beam angles) in the characterization of few-cycle pulses. Cross-correlation FROG (XFROG)  uses an additional reference pulse, which does not need to be spectrally overlapping with the pulse under investigation. The recorded signal is obtained by sum or difference frequency generation of the two pulses. This method can be very sensitive, and can be applied in different spectral regions. Beyond these traditional FROG measurement methods, refined versions of FROG have been developed, which can be applied even to very short pulses (with angle dithering of the crystal to remove strong effects of group velocity mismatch in the nonlinear crystal) or to fairly long pulses (where a high spectrometer resolution is required). A particularly compact setup is achieved with the GRENOUILLE geometry , which has no moving parts and even allows the measurement of additional features such as spatial chirps. A waveguide as the nonlinear component allows detection at ultralow power levels, and polarization scrambling makes possible polarization-independent measurements, which facilitate e.g. the delivery of pulses via fibers . A possible alternative to frequency-resolved optical gating is spectral phase interferometry for direct electric-field reconstruction (SPIDER), as explained in the article on spectral interferometry.